2nd generation Y-cam Bullet HD cameras. What’s new? Y-cam Solutions have launched their 2nd generation Y-cam Bullet HD cameras, available in either HD 720p or HD 1080p versions. Y-cam is a popular camera brand amongst home users and small and medium sized businesses, with all Y-cam models offering wireless capabilities, ease of use and compatibility with a wide range of operating systems, browsers and mobile platforms. So how have the new 2nd generation Y-cam Bullet HD cameras improved from the first generation models? We’re on a roll this month. Having just predicted the 7 top trends in video surveillance, we are now going to open up the oracle again and share the 5 best wireless network cameras on the market right now. Y-cam Bullet White – 10% discount whilst stocks last! 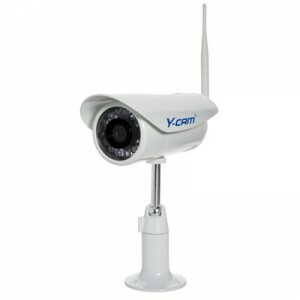 We are currently offering a 10% discount on the Y-cam Bullet White. While stocks last these outdoor IP cameras with infrared technology, auto day/night switching, 2-way audio, a micro SD slot and PoE can be purchased for just £214 instead of their usual price of £239! Stocks will go quickly so don’t miss out on your chance to get this feature-packed IP camera at a great discounted price. Note: This offer is only available on the Y-cam Bullet White. Not in conjunction with any other offer. Posted in Company news, Y-Cam | Comments Off on Y-cam Bullet White – 10% discount whilst stocks last! Y-cam has launched a new version of its firmware, 4.21, for its SD and Bullet product ranges. The update brings with it a number of key new features, but the one that really catches the eye is the new NAS-Ready™ system. Currently, a camera and a Network Attached Storage drive require some kind of go-between, like a computer or third-party software, in order to communicate. 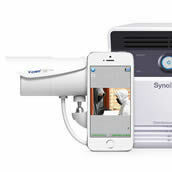 With NAS-Ready™, Y-cam cameras can now send video directly to any compatible NAS for capture and storage. This will help to simplify setup and reduce running costs. NAS-Ready™ isn’t shy on the storage side of things either – up to 10,000 video and 10,000 image files can be stored per camera. The Y-cam Bullet and the Vivotek IP7142 are two fixed view IP cameras designed for outdoor installation and fitted with infrared LEDs, designed above all to capture high-quality security footage in locations with no external lighting. From the similar price points and how they are pitched, it is easy to tell that they are very similar, and are both aimed at small to medium sized businesses, but what are the real differences between these two similarly specced cameras? Y-Cam have released the latest firmware update for their Y-Cam White, Y-Cam Black and Y-Cam Knight IP Cameras. Here’s a quick how to guide for something we get asked about a lot. How to use your Google Mail (Gmail) account with your Y-cam to send emails. Almost all IP cameras have some form of email functionality but not all support a secure SSL connection which Google Mail requires. This isn’t normally a problem as the email account details you get from your ISP can be used in most circumstances but for people who want to use Gmail, read on. On the iPhone or iPod Touch you can visit the camera as you would in any desktop browser and once logged in the Y-cam will auto-detect the browser type (in this case Safari) and display a motion jpeg stream. This is a live video stream directly from the camera, but not optimised for the mobile viewing platform. On your phone’s browser visit ipaddress:port/en/mblogin.asp and you will see 3 options: Live picture, 3gpp stream and mobile settings. From here you can choose whether to view a static image, a video stream optimised for mobile phones, or change the settings (which you may have to do to get the 3gpp stream working on your phone. We get asked this question a lot. Whether it’s from a customer of ours who has a business they would like to promote, say from the leisure or tourism industry or from a customer who is an end user and is working on their family website, we can help with the answer. We will be running a number of these guides to cover as many camera manufacturers as possible. This guide will focus on the Y-cam. The Y-cam is ideal for use as a streaming IP webcam as it is affordable and can be placed outdoors using it’s specially designed Shell housing. The 2nd Generation Y-cam boasts a new MJPEG video compression format which has been added to make the camera compatible with a wider number of Internet browsers and computer platforms. Since the update we get a lot of interest from Mac users as the Y-cam now represents an affordable home security solution on the Mac platform. However, we must point out that the Y-cam is NOT fully supported. You won’t be able to use the video clip creation tools, you won’t recieve any audio and you won’t be able to use the installation software which comes on the CD-ROM to help set up the camera. This is where a Mac user will struggle. The software which comes with the camera is Windows only so the initial setup can prove difficult for the average Mac user. We are here to lend a hand.